Background: Irisin; a novel myokine/adipokine; encoded by FNDC5 gene have been suggested to play an important role in energy metabolism and obesity. However, the genetic variations at this locus and their effects on different metabolic parameters is still poorly understood. Aim: This study aimed to investigate the role of FNDC5/irisin gene polymorphisms (RS16835198 and RS726344) in obese individuals and their genotype phenotype correlation with circulating serum irisin level and other biochemical parameters like glucose, lipid metabolism and liver enzymes. Methods: The study included 200 subjects divided into two groups: obese group (110 subject) and control non obese group (90 subject). All selected individuals were subjected to a comprehensive questionnaire, clinical assessment and laboratory investigations including fasting blood glucose (FBS), serum insulin, lipid profile (Total Cholesterol (TC), Triglycerides (TG), Low Density Lipoprotein (LDLc), High Density Lipoprotein (HDLc), liver enzymes (ALT, AST, GGT), Serum irisin level and HOMA-IR was calculated. 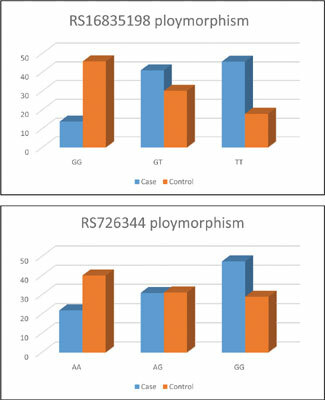 DNA extraction and FNDC5 allelic discrimination analysis for FNDC5 SNPs, rs16835198and rs726344 using the TaqMan SNP genotyping assays by Real time PCR. Results: In obese group; serum irisin was significantly lower (0.55 ± 0.2) than control group (1.7 ± 0.3) P value < 0.001. Regarding genotype and allele frequency, T allele of rs16835198 polymorphism is associated with high BMI, high total cholesterol, TG and LDL-C, low level of serum HDL-C, high FBS, low serum insulin, low HOMA-IR and low serum level of irisin. While G allele of rs726344 is significantly associated with high BMI, FBS, low serum insulin and HOMA-IR, High total cholesterol, TG, LDL-C, low level of HDL-C and low serum irisin. Conclusion: Our data suggest that FNDC5 SNPs, rs16835198and rs726344 are associated with obesity in Egyptian population. GG genotype and G allele of rs726344 variant and TT genotype and T allele of rs16835198 variant may increase the susceptibility to obesity and there were a genotype phenotype correlation with circulating serum irisin and several metabolic parameters. Obesity, FNDC5 gene, SNPs, myokines, serum irisin, every metabolism.